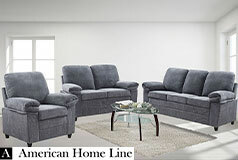 The Finley Ultra Plush Leatherette Collection is designed with comfort in mind. The Finley is made for people who love to entertain and who enjoy relaxing for hours at a time. The sofa, loveseat and chair are stuffed with extra padding. You get added billowing support in all the right places such as in the back cushions, the arm rest and in the head support.